If there is a woman of the Spanish sixteenth century whom everyone thinks they know and who is the subject of passions, legends and myths, that woman is Ana de Mendoza y de la Cerda, Princess of Éboli. 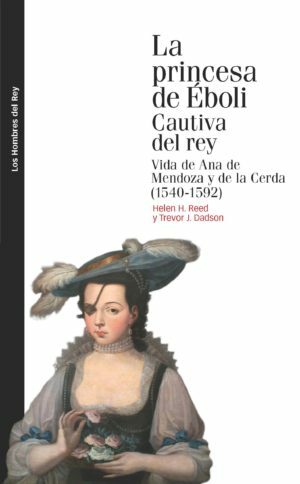 In this new biography, Helen H. Reed and Trevor J. Dadson present the most realistic and objective portrait to date of Ana de Mendoza (1540-1592), that of a noble woman very much of her time, worried over her children, her husband, her estates, her honour, her place in the world, the injustices she had to suffer, and her soul. In order to put together this revisionist biography of the Princess, the authors have made use of much hitherto unknown documentation, in which they have discovered new data on her childhood, education, daily life, religiosity and intimate relationships, and which offers new perspectives on her role as courtier, nun, estates administrator, litigant and, finally, prisoner in her own Palace in Pastrana. Helen H. Reed is Emeritus Professor of the State University of New York at Oneonta, where she taught, among other subjects, Spanish Golden-Age literature, culture and history. She has published a monograph on the picaresque novel, The Reader in the Picaresque Novel (1984), and various articles on Lazarillo de Tormes, Guzmán de Alfarache, the Relaciones of Antonio Pérez, and different texts of Cervantes. In recent years she has devoted most of her time to the study of women in Golden-Age Spain, writing articles on the Princess of Éboli, Saint Teresa, and Catalina de Cardona. With Trevor Dadson she has published Epistolario e historia documental de Ana de Mendoza y de la Cerda, princesa de Éboli (2013), a collection of the Princess’s letters —autograph or signed by her— as well as legal documents, many of them unknown and previously unpublished. Trevor J. Dadson is Professor of Hispanic Studies at Queen Mary University of London and the author of numerous books and articles on the literature, textual criticism and sociocultural history of the Spanish Golden Age. Among his many publications are the following recent monographs: Gabriel Bocángel y Unzueta, Obras completas (2001), Los moriscos de Villarrubia de los Ojos (siglos XV-XVIII) (2007; 2.ª edición, 2015), Historia de la impresión de las Rimas de Lupercio y Bartolomé Leonardo de Argensola (2010), Diego de Silva y Mendoza. Poeta y político en la corte de Felipe III (2011), (with Helen Reed) Epistolario e historia documental de Ana de Mendoza y de la Cerda, princesa de Éboli (2013), and Tolerance and Coexistence in Early Modern Spain. Old Christians and Moriscos in the Campo de Calatrava (2014). In 2008 he was elected a Fellow of the British Academy and in 2015 he received the Encomienda of the Order of Isabel la Católica for his services to Spanish culture.